Restaurants are often a good source of inspiration for home kitchen creativity. During a recent visit to the new Rosa Mexicano in Friendship Heights, Chris really enjoyed an entree of chicken tortilla pie. The dish was corn tortillas layered with pulled chicken, Chihuahua cheese and a poblano cream sauce. For my take, I wanted something similar, although with a little more complexity. 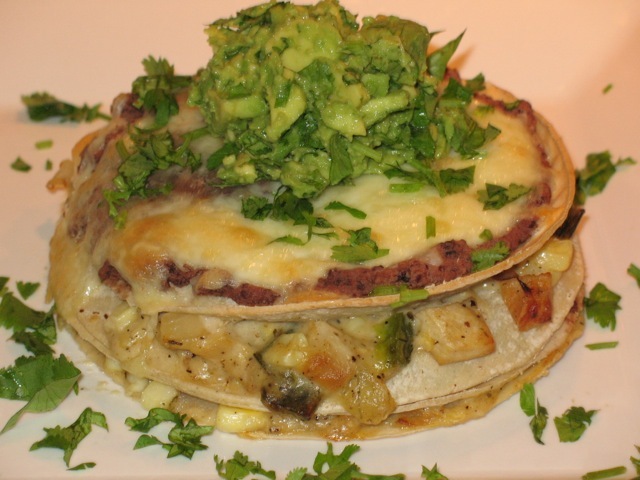 I decided to alternate layers of chicken, cheese and peppers with a spicy black bean puree. Getting the various components ready is the biggest challenge for this dish. You can do them one at a time, but it will take a while. I recommend getting the beans started first so they can cool a bit before pureeing them in a food processor. The chicken doesn't require much care either, so it can get started early too. I'd never cooked a poblano pepper before. In fact, I didn't know what one looked like and had to ask a produce clerk for help. It's a good thing, as I almost picked up a cubanelle instead. For the chicken layer, I wanted something with a cheese sauce, but I didn't want it to be too rich. So I shied away from using heavy or sour cream and instead melted the monterey jack in some bechamel. 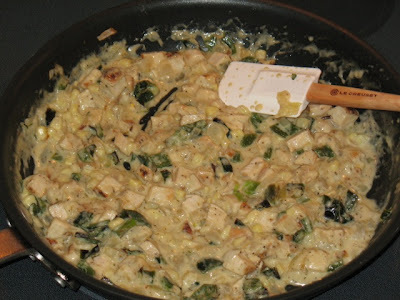 The texture was just right when mixed with the sauteed onion, chicken and diced poblano. To layer the pies, I started with a tortilla, then a layer of chicken, another tortillas, then a layer of bean puree, and then all that repeated again with extra cheese on the final top layer of bean puree. 1. 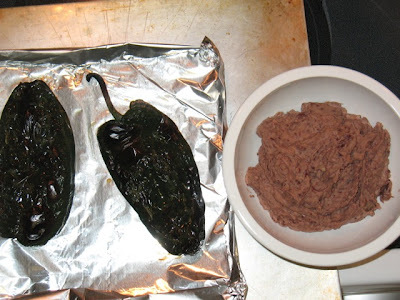 Make the black bean puree. Heat olive oil in a small sauce pan over medium heat. Add the garlic and saute until soft and fragrant. Add the beans, spice and lime juice and reduce heat to simmer until the liquid has been absorbed or evaporated off, about 10 minutes. Set aside to cool slightly then puree cooked mixture in a food processor. 2. Cook the chicken. Heat 2 tbsp. olive oil in a medium skillet over medium heat. When the oil is hot, add the chicken breasts and season with seasoned salt and ground black pepper. 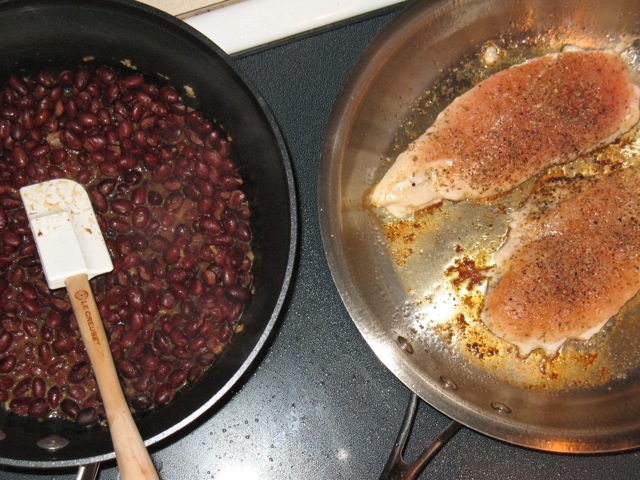 Cook for 5 minutes, flip breasts, and cook for another 5 minutes until breasts are browned on both sides. Set aside to cool and then chop into 1/2-inch size pieces. 3. Prepare the pepper. Preheat the oven broiler with the rack in the highest position (about 4-5 inches from broiler). Cut the pepper in half to make two long pieces, removing the seeds as desired to moderate hotness (I left about half of them in). Place the two pieces of pepper skin side up on a baking sheet, spray with olive oil and broil until the peppers start to black in places (watch carefully, cooking time will vary and it won't take very long). Set aside to cool and then chop finely. 4. Preheat the oven to 375 F (since it was just used to broil the pepper, it should heat up quickly). 5. Make the bechamel. Heat the last tbsp. of olive oil in a large skillet. Add the onion and oregano and saute until the onion is softened. Season as desired with seasoned salt and fresh-ground black pepper. Add the flour and stir with a whisk to cook it a few minutes. Add the milk to the pan and continue whisking until the mixture starts to bubble and thicken. Reduce heat to medium-low. 6. Stir half of the shredded cheese into the bechamel until it melts and is smooth. Add the chopped sauteed chicken and chopped blackened poblano pepper. 7. Assemble the pies. Spray a large baking sheet with olive oil. Assemble the first pie on one end of the baking sheet in the following order: 1) corn tortilla, 2) chicken-cheese mixture (use about 1/4 of the mixture, 3) corn tortilla, 4) bean puree (use about 1/4 of the puree), then repeat steps 1 through 4 to make an eight-layered pie with two layers of bean and two layers of chicken. Top the final layer of bean puree with about half of the remaining cheese. Repeat to make a second pie on the baking sheet next to the first pie. 8. Bake the pies in the hot oven for about 25 to 30 minutes until the cheese on top has melted and browned a bit. 9. While the pies are baking, prepare the guacamole. Peel avocado and place flesh in a medium bowl. Add lime juice and mash together (I like to use a pastry blender). Mix in half of the chopped cilantro. 10. Once the pies are done, serve them them topped with a big dollop of guacamole and some chopped fresh cilantro. This was really good. Thanks for making it, honey! This sounds fabulous, thanks for sharing this recipe.